Cristiano Poleto is a civil engineer and sedimentologist. He is Professor at Hydraulic Resources Institute (IPH) and has published seven books in Brazil. His research and teaching interests include sediments, urban watersheds, and urban hydrology. He is also project supervisor for a number of research students (graduates and postgraduates). Susanne Charlesworth is Reader in Urban Physical Geography at Coventry University, Coventry, UK. She is Leader of a Sustainable Drainage Applied Research Group and her research interests are mainly the impacts of urbanization on the physical environment and its mitigation by sustainable means. 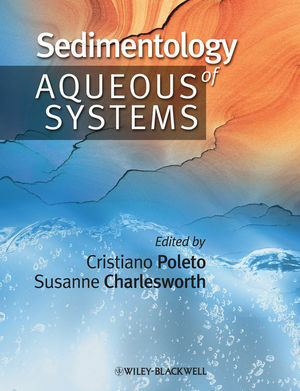 Introduction: the sedimentology of aqueous systems (Cristiano Poleto & Susanne Charlesworth). 1 Surrogate technologies for monitoring suspended-sediment transport in rivers (John R. Gray & Jeffrey W. Gartner, editors: Chauncey W. Anderson, Gregory G. Fisk, Jeffrey W. Gartner, G. Douglas Glysson, Daniel J. Gooding, John R. Gray, Nancy J. Hornewer, Matthew C. Larsen, Jamie P. Macy, Patrick P. Rasmussen, Scott A. Wright & Andrew C. Ziegler ). 2 Surrogate technologies for monitoring bed-load transport in rivers (John R. Gray & Jeffrey W. Gartner, editors: Jonathan S. Barton, Janet Gaskin, Smokey A. Pittman & Colin D. Rennie). 3 Sediment characterization (Edson Campanhola Bortoluzzi, Maria Alice Santanna dos Santos & Marcos Antonio Villetti). 4 Trace elements in urban environments: a review (Susanne Charlesworth, Eduardo De Miguel & Almudena Ordóñez). 5 Urban aquatic sediments (Cristiano Poleto, Susanne Charlesworth & Ariane Laurenti). 6 Biomarkers in integrated ecotoxicological sediment assessment (Mark G.J. Hartl). 7 Tools for assessing contaminated sediments in freshwater, estuarine, and marine ecosystems (Donald D. MacDonald & Christopher G. Ingersoll).